How to display a life that never wished to be exhibited? How to present the history of a man who did not have a linear life? You may discover the answers in 'Calouste: a life, not an exhibition', an initiative held under the auspices of the commemorative programme for the 150th anniversary of Calouste Gulbenkian. This exhibition, which seeks to convey a life without exhibiting it, starts out immediately back-to-front, with its legs up in the air. Across a set of screens, various people tell of his history – through stories such as how Calouste ended up changing their lives. And how did they change? Through the Foundation bearing his name, established by his last will and testament. That is where we begin on this journey in discovery of a man who died in Lisbon in 1955 and bestowing on Portugal both his art collection and his fortune. Along the path, that begins with the telegram announcing his death, it is down to the visitor to take on the role of detective or archaeologist and gather pieces, remains, clues, interpret the gaps and the silences so as to, in the end – and only at the end – better understand the figure of Calouste Sarkis Gulbenkian. Its curator, Paulo Pires do Vale, guarantees this is not about a visit imposing some truth, life or biography. “It’s down to visitors to play active roles in constructing” the ideas they gain of Calouste, he explained. It was all thus designed. Beginning with the space (the Gallery of the Lower Floor of the Headquarters Building), “which runs deep and takes the visitor off in direction of the Founder, the foundations” of this life. This departs from the context of Mister Gulbenkian to enter into the more intimate universe of Calouste, a man who, despite having been the richest in the world, always spurned exhibition. “He had a reserved side, secretive and withdrawn that did not extend to exposing himself”. This was, therefore, an “impossible exhibition”, stated Pires do Vale. Turning the weaknesses into strengths, the curator opted to pick up on “this contradiction” and deploy it “immediately in the title”. He correspondingly adopted fragments of the life of Calouste, objects, photographs, clues left open by his diaries and letters, details that might be explored to a greater or lesser extent and that leave behind a perspective on that that which might have been Calouste. With this work, that creates an “experience of space, an intellectual, creative, emotional, exciting and curious experience as well as proposing pathways”, setting the viewer thinking; “calling into question the notion of a timeline, of causality and leaving space for the imagination” so as to, finally, enable the visitors themselves to “build their own interpretation” of this figure who was born 150 years ago and gave his name to a foundation for the good of humanity. 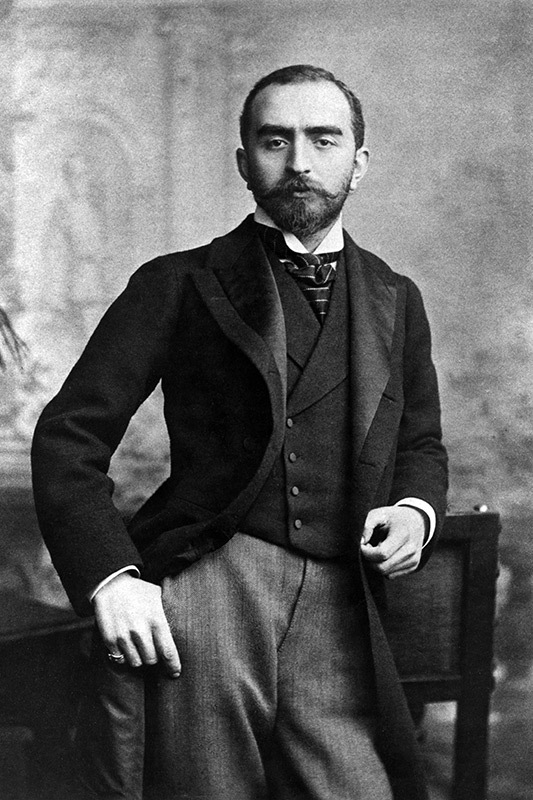 Calouste Gulbenkian was born on 23 March 1869 in the Ottoman Empire. One hundred and fifty years after, the Foundation commemorates his life through the awarding of prizes to young persons (aged from 15 to 25) who best responded to the question “Who is Calouste?” whether through the visual arts, music, text or film. Late in the afternoon, this day shall also feature a concert with the Gulbenkian Choir and Orchestra as well as the launching of a commemorative stamp for Calouste Gulbenkian’s 150th anniversary. The two events precede the inauguration of the exhibition Calouste: a life, not an exhibition.